Designer Jason Wu will launch his debut fragrance, Jason Wu Eau de Parfum. The new scent was made under licensing arrangements with Parlux. 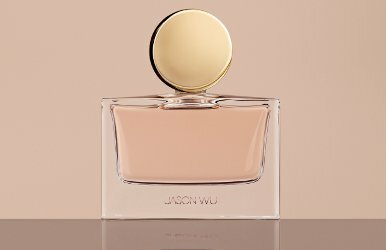 Jason Wu Eau de Parfum will debut in August in Saks Fifth Avenue and Hudson Bay stores, in 90 ml (and possibly other sizes as well) and in matching body products. Update: Jason Wu Eau de Parfum is a woody floral, and features notes of pink pepper, fig, freesia, peony, jasmine and musk. Yes — hope it looks as nice in person. Pretty bottle! Very serene. I might try this one when it is released. The bottle, not the cap, reminds me of Aerin’s Private Collection for Lauder. I hope it’s an elegant and well built fragrance.